During the next few steps you will be logging in to your QuickBooks Online account. This process takes place in the Commerce Sync Dashboard. If you need assistance with your sign-in information or account selection for your QuickBooks account, please reach out to Intuit Support by calling 800-450-8475. Click on the Connect to QuickBooks icon. 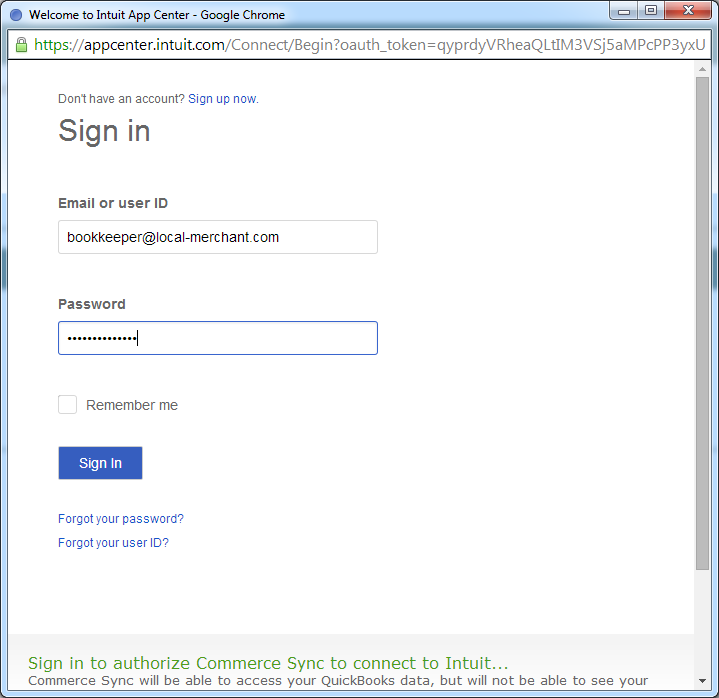 Sign-in to your QuickBooks Online account using your QuickBooks Admin login. If you have multiple QuickBooks company files, you will be prompted to select the one you'd like Commerce Sync to connect to. Commerce Sync will verify your connection to QuickBooks Online. Once you see the green check marks, select your bank account and click Continue. For multi-location merchants, this is where you will select the Customer for you different locations. See Transferring Sales for Multiple Locations for more information on this. Going forward, each day Commerce Sync will transfer all of your sales activity for the previous day to QuickBooks Online. This transfer will occur after midnight to ensure that all orders for the day are closed. Find out more information on transferring sales that you had prior to installing here.